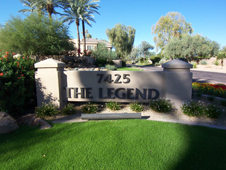 The 55 single family homes of The Legend are located near the north security gate of the Gainey Ranch development, just off Mountain View Rd. These 3, 4, and 5 bedroom custom homes range in size from 2520 to 4900 square feet. They enjoy “gate within a gate” security and many have beautiful golf course views. HOA fees are $491 monthly. Prices from the $900,000 area.